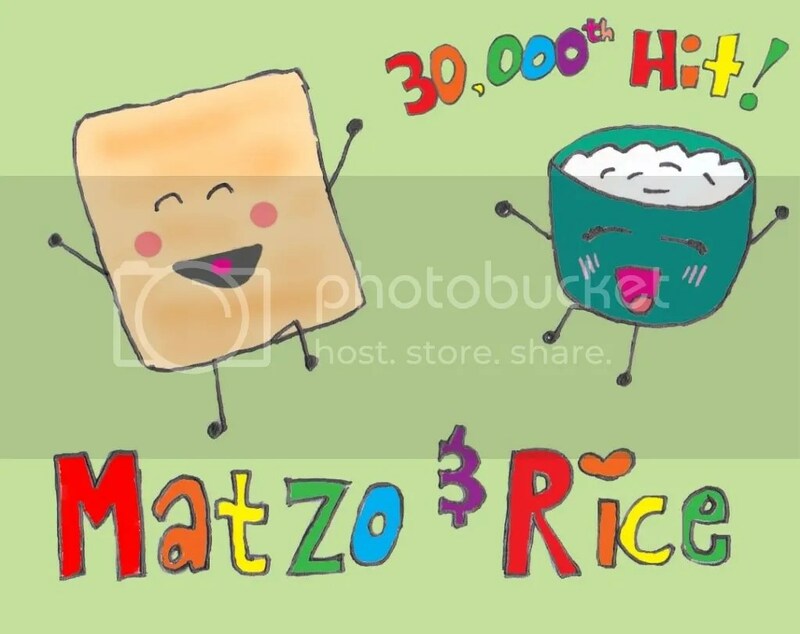 Matzo and Rice 30,000th Hit Contest! Rice and I just got our 30,000th hit! We were also *this* close to making it in under a year. Oh well. None-the-less, Rice and I are holding a contest to honor and reward our faithful readers. Rice and I met in 1999 when we were placed next-door to each other in the dorms. Since we met in the great state of Wisconsin, why not have a beer themed contest!? Rules after the bump! We at Matzo&Rice understand not everyone likes beer. You can tell us about your favorite beer commercial, logo, or a humorous story involving beer. You don’t even have to drink it. That leaves more for us, anyway. When you post, make sure you include your email in the “email” tab. We will make sure it’s not posted on the site. If you don’t want to do that, and you’re brave, feel free to post in this format: youremailhandle [at] domain [dot] com. We will use a random number generator to select the winners. In the event that the winners do not post something to do with beer, do not contact us back, or do not want the prize (we still would like to hear your story), we will select the next random number. Also, please, no swearing. This is a family site. *snicker* Really, though, keep it PG-13. Our mothers read this. Contest ends: Sunday, October 11, 2009 at 11:59 pm EDT. The last time Rice and I hung out, we did a tasting of great WI beers, like this one from Capital Brewery! We have 2 prize sets for the winners to choose from, first chosen first sent. Check your email if you’re one of the 2 winners. 1. 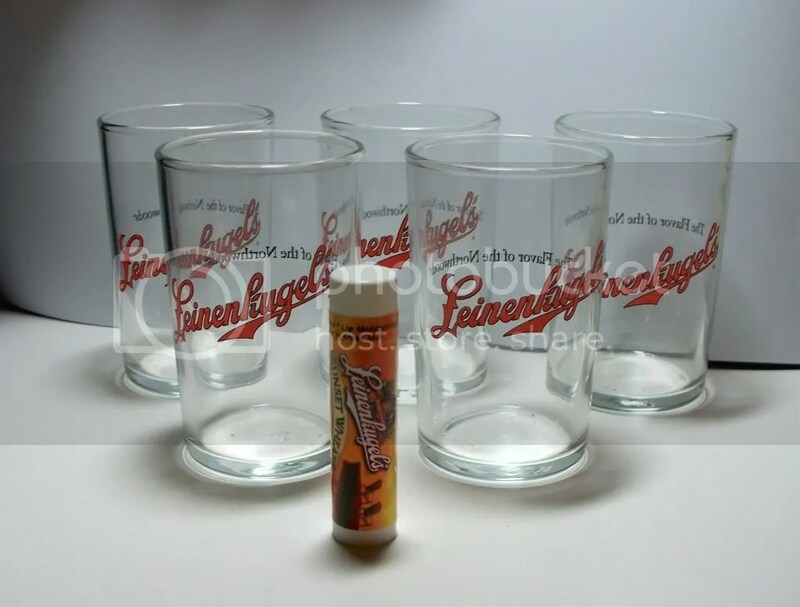 Set of 5 Leinenkugel’s mini glass glasses. Enjoy the “Flavor of the Northwoods” in these adorable tasting cups. Should your lips get chapped while imbibing, you can use your very own Leinenkugel’s Sunset Wheat lip moisturizer! Wet your mouth and moisterize your lips! 2. 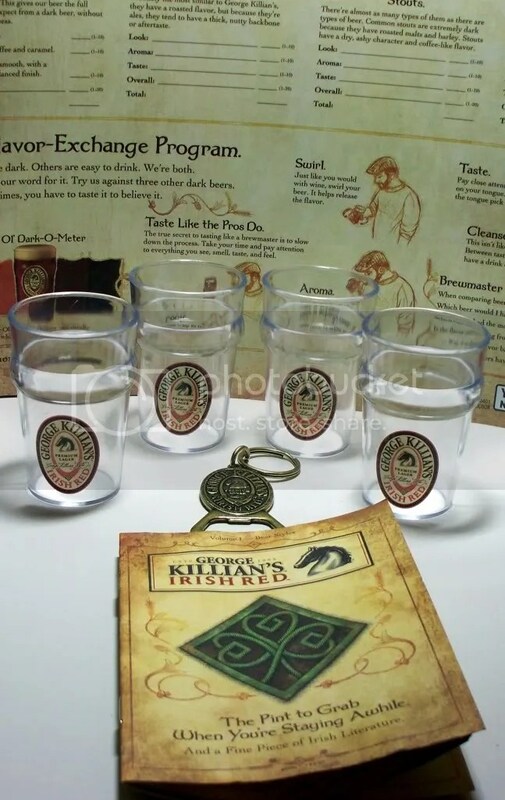 Set of 4 Killian’s Irish Red Premium Lager mini plastic cups, along with a Killian’s bottle opener, beer styles handbook (16 pages), and poster explaining the differences in flavors and colors of beer. Killian's pulled out the stops for you to have a grand tasting experience! This entry was posted on September 28, 2009 at 4:22 pm and is filed under Contest, Drinks. You can follow any responses to this entry through the RSS 2.0 feed. You can leave a response, or trackback from your own site. I’ve always drunk beer, but it was July 15, 2006 when I discovered my favorite beer and favorite beer style. I was at Durty Nellie’s concert hall outside Chicago for a radio promo show and was given a couple drink tickets. I was bored with the regular offerings the bars have around here, so I pointed to a tap – Three Floyd’s Alpha King. The first sip puckered me up. This was a pale ale, bright on the citrus, extra hoppy, yes smooth. To this day, this is my favorite beer and my overall favorite style. The first beer I enjoyed the taste of was Killian’s Irish Red. I stayed away from beer until my first year of grad school in 2001 when my friend Erin introduced me to Blue Moon! I grew up in a strict family that told me to stay away from beer because it tasted like “Horse Pee”. After smelling it, I believed this to be true until I turned 21, and tasted it for the first time. I will never forget the taste as the Heineken glided down my throat. It was love at first gulp. I’m not a beer snob by any means, but I never really understood how good beer could be until I went to Germany. There I was, sitting in a questionable upper room of a questionable restaurant in Bamberg, trying to figure out the menu when I found the beer section. I thought I’d be safe there, but there were so many varieties! As I tried to decide what I was in the mood for, my well-traveled friend pushed my hand aside, pointed to the menu, and said, “There. That one. You won’t regret it.” I ordered my first Bamberg Rauchbier–“smoke beer.” The malts are roasted over open flames, and when you first taste it, you get all the glorious smoky flavor that Alabama barbeque aficionados argue over all summer long. None of my American friends believe me when I say Germany has a smoked pork-flavored beer; “There can’t be something that good on this earth,” they argue. But there is. I can’t wait to get back to Bamberg and try it again. And that’s what started me down my road to becoming a true beer lover. For a reasonable American approximation of the smoky flavor, I recommend Samuel Adams’s Cream Stout, although it’s made with roasted barley, chocolate, and caramel, so it’s admittedly sweeter and less bacon-y than the Bamberg variety. 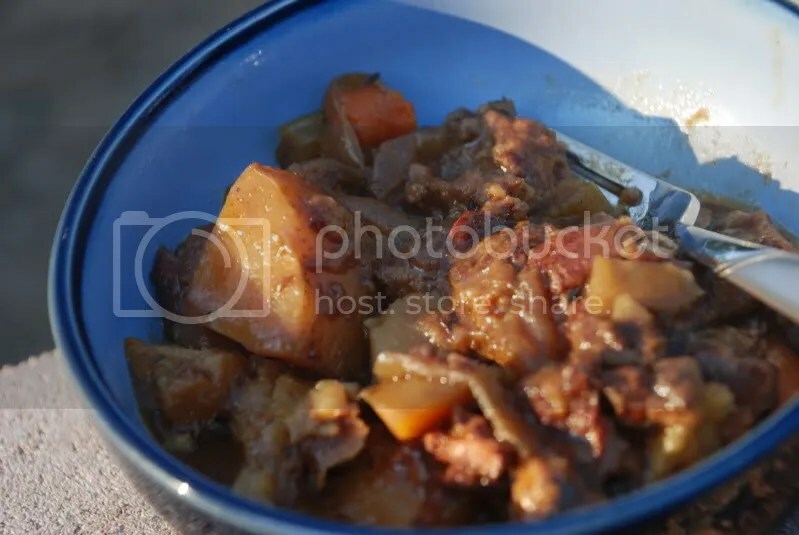 My new favorite beer recipe is Guinness beef stew, made in the crock pot. I came home to it today after work. Yum! Let’s see…..the first time I realized I liked beer, I was at a brewery in Dillon Colorado. The microbrews were amazing. Shortly thereafter, I was sitting on the deck of a rented cabin, drinking a Breckenridge Brewery Jefe Proper. The snow, the outdoor fireplace…..mmmmm…memories! I don’t like beer, but I like ice cream. Matzo gave me a recipe for Samuel Adams White Ale Fresh Berry Sherbet. I made it. She liked it. So did her mom, who also doesn’t like beer. Do I win? I want to thank everyone for reading our blog and entering our contest! Congrats to Kristin and Dawn for being randomly selected! Outstanding site. You have gained a new regular reader. Please keep up the superb posts and I look forward to more of your entertaining updates.